12/1/16 I am peaceful Isaiah 26:3 You will keep the peace, a perfect peace, for all who trust in You, for those who dedicate their hearts and minds to You. 12/3/16 I am self-controlled 2 Timothy 1:7 God didn’t give us a spirit that is timid but one that is powerful, loving, and self-controlled. 12/4/16 I am patient James 1:4 If you let patience work in you, the end result will be good. 12/5/16 I am focused Proverbs 4:25 Focus your eyes straight ahead; keep your gaze on what is in front of you. 12/6/16 I am blessed Ephesians 1:3 He has blessed us in Christ with every spiritual blessing that comes from heaven. 12/8/16 I am balanced Proverbs 11:1 An accurate scale is His delight. 12/11/16 I am rested Exodus 33:14 My presence will travel with you, and I will give you rest. 12/13/16 I am loving Ephesians 3:17 May love be the rich soil where their lives take root. 12/16/16 I am encouraging Isaiah 50:4 The Almighty Lord will teach me what to say, so I will know how to encourage weary people. 12/17/16 I am hopeful 1 Peter 1:3 Through God’s great mercy we have been reborn into a living Hope. 12/19/16 I am restored Psalm 23:3 He restores my soul. 12/22/16 I am strong Philippians 4:13 I can do all things through him who strengthens me. 12/23/16 I am healed Isaiah 53:5 By His stripes we are healed. 12/24/16 I am successful Proverbs 16:3 Commit your works to the Lord submit and trust them to Him, And your plans will succeed if you respond to His will and guidance. 12/26/16 I am favored Psalm 5:12 Because you, Lord, bless the righteous. You cover them with favor like a shield. 12/27/16 I am Thankful 1 Thessalonians 5:18 No matter what happens, always be thankful, for this is God’s will for you who belong to Christ Jesus. 12/28/16 I am Faithful Romans 10:17 So faith comes from hearing the Good News. And people hear the Good News when someone tells them about Christ. 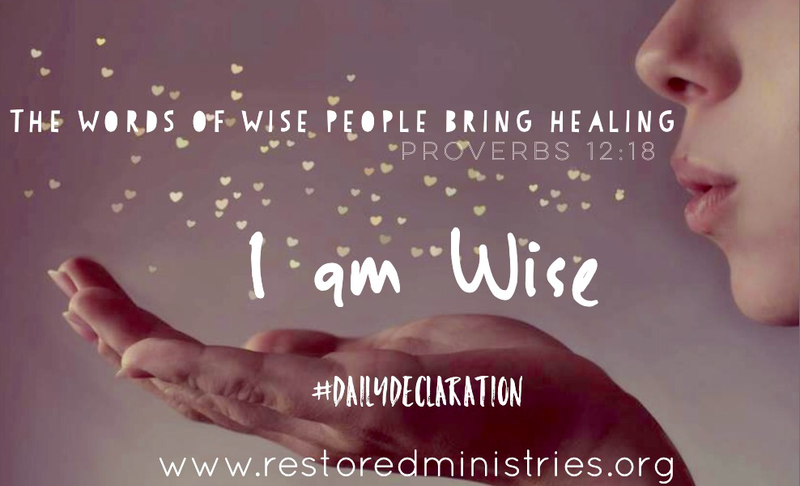 12/29/16 I am wise Proverbs 12:18 The words of wise people bring healing. 12/30/16 I am victorious 1 Corinthians 15:57 Thanks be to God, who gives us this victory through our Lord Jesus Christ! 12/31/16 I am qualified Colossians 1:11-12 Be strengthened with all power, according to his glorious might, for all endurance and patience with joy; giving thanks to the Father, who has qualified you to share in the inheritance of the saints in light. Head over to our Instagram @restoredpeople or our Facebook Page to see all the images for the December Daily Declarations. You don’t have to just do in December- You can start now for the New Year! 1. Say something in a solemn and emphatic manner. * reveal one’s intentions or identity. 1. 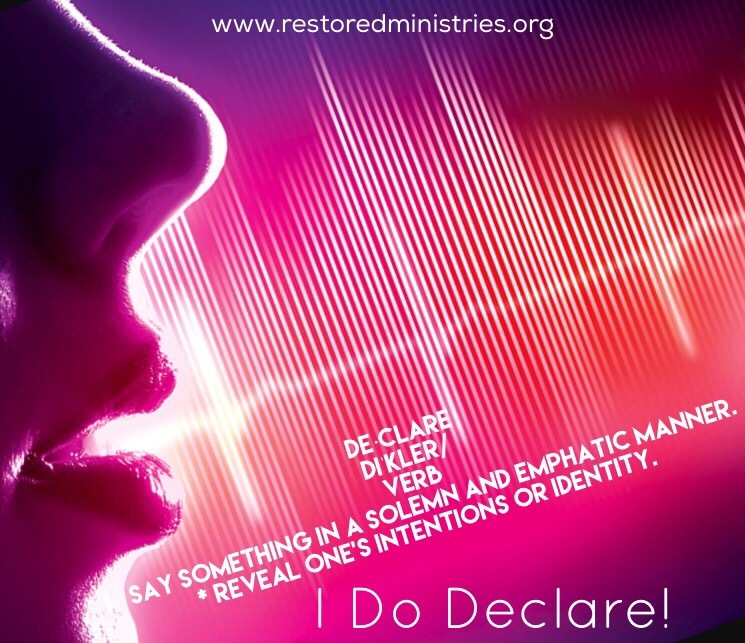 The act of declaring. We have a new category Declarations. This category is designed just for declarations and they will be in image format so you can reshare or print them out for everyone who needs to be encouraged. Thank you – Kim Weingart for kicking it off! 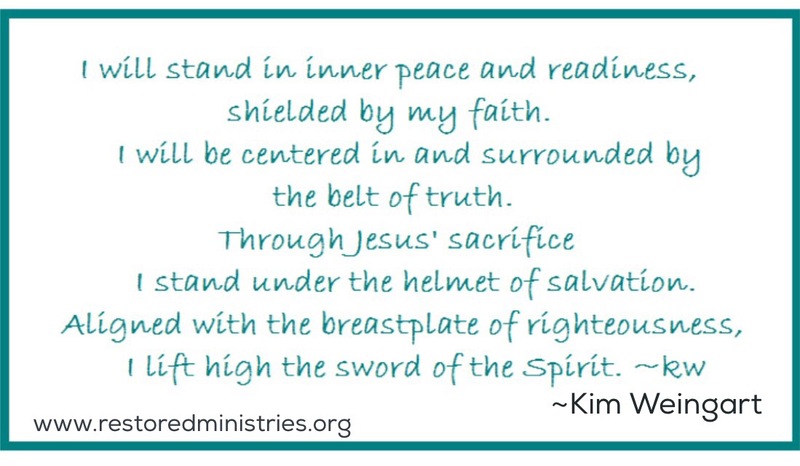 Be sure to check out Declarations on our blog so you can see Kim’s amazing declaration.